We've been getting desperate around here. We haven't had any step stools for the kids to use in the bathrooms, and they've gotten creative - a pair of stacked paint cans downstairs, and a plastic file box upstairs. I've known the need for a better step stool has been facing us for some time, but I couldn't find anything in the stores that I liked (plastic or pseudo-wood). After learning of a recall of some popular step stools sold by Target, I knew that wasn't the route to take. Yet again, I altered the plans I found just a bit. Ana's Vintage Step Stool Plan called for the bench to be about 15 inches deep and wide. I knew that was bigger than what would work in our narrow bathroom downstairs, so I took the liberty to tweak the plans by making them just about 3 inches smaller in those dimensions. I am thankful to my Dad for letting me use his woodshop, scraps, and tools. And for doing the big cuts with the table saw. Some day, I'll do my own table saw work, but that will probably wait until he gets a new saw that isn't so... particular. So for now, I defer to his experience. For my step stools, I used 3/4" birch plywood and oak plywood for the sides and steps, and poplar solid wood for the brace pieces. After we checked and rechecked the altered dimensions, Dad made the cuts. I worked out my pattern for the cutout on the sides, and took it over to the jigsaw. Once the pieces were cut, we took them to the belt sander (Dad was doing some sanding while I was cutting. It really helped save time to have two pairs of hands working on this!). I tacked the pieces together with staples, then we took a break and went swimming. Because, hey, everyone needs a break. The kids liked the step stools, and they were even secure enough with just the staples for them to give them a try, but not done enough for me. Later that evening, we went back out to the shop, drilled the screw holes and applied a great number of screws to the step stool. Perhaps it was overkill, but they are STURDY. Done enough to use for a trial run while we were visiting my parents! The step stools are a great height. At just over 12 inches tall, they give enough lift for Nathanael to reach the faucets to brush his teeth and wash his hands. I brought them home unfinished. Once home, I filled the countersunk screw holes with wood filler, and applied a lot of sand paper. I know I need to work on my wood filler technique. I'm not satisfied that I can see where the screw holes are after painting, but that's how it goes. 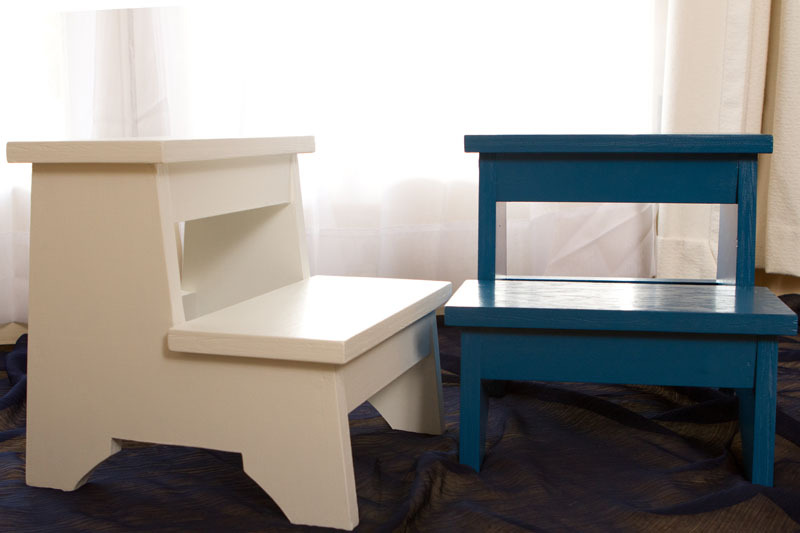 I didn't take the time to prime the step stools, and just applied two coats of paint to each. I suspect that I will suffer the consequences of not properly preparing the paint surface with primer in a few years, but I'll just deal with stripping, priming and painting then. Perhaps I'll be ready for a new paint color then! Overall, it took me about 2.5 hours build time, and then another 2 or 3 hours of finish time. I'm slow worker, though, and did the work over several days, so that's a guess. The step stools are great, the kids enjoy having a stable piece to work in the bathrooms.